Today, June 29th, is the Red Nose Day, hosted by Red Nose Day, Red Nose Me and SIDS and Kids, when lots of people around the world post a fun red nose on their favorite self photos, to support Australia on a serious cause: helping to prevent SIDS (Sudden Infant Death Syndrome), and giving support to families that have suffered the loss of a baby or child during pregnancy, birth, infancy and childhood regardless of the cause. For each Red Nose photo posted, $1 is donated to the cause. Their goal this year is to reach $25,000 and hopefully up! This is the second year that I join this by posting my silly photo on Facebook and sharing the info. During pregnancy, I read everything I could lay my hands on about motherhood & babies, of course, and I was well informed about SIDS. But it didn't mean I wouldn't get worried about him chocking during his sleep (he had a minor reflux case, to 'worsen' things): I had to check almost every five minutes to see if he was breathing the first nights, lol! A typically first-time mom behaviour, more normal than I thought it was. I relaxed after some time, but I was always alert and careful on how to put him to sleep, avoiding any clothes or covers that would make him choke, and especially, putting him in the right position to avoid choking. Information needs to be spread, and it would be wonderful if other countries adopted this lovely campaign to help moms and families and their loved babies. Mortality rates by SIDS is still high, after all. The only problem was that exactly when he was picking the second name from the hat, the battery ran out and I had to quickly turn the camera on again. The video is therefore broken in two, but it's a fair giveaway and not manipulated! So here they are. Congratulations lucky winners!! The first winners takes the pink skull keychain, and the second one, the black skull keychain. I hope you like them! You'll also win, each, an exclusive paper skull magnet made by my little witch - that's what I call an interactive assistant, lol! :o) I'll email you asking your addresses, so I can ship your skull keychains still this week! Thank you all for joining this giveaway, and please visit the other Blog Hop's great participants! 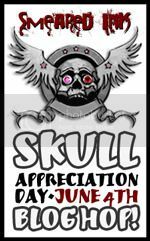 Skull Appreciation Day Blog Hop is up! Good Monday, everybody! Nothing better to start the week than having a great Blog Hop full of awesome art and incredible giveaways for those who love skulls, these lovely things we carry along with us every day of our lives... ;o) The Skull Appreciation Day Blog Hop was created two years ago by Smeared and Smudged blog to celebrate this passion. Click here to learn about it and how to participate. To win one of the skull keychains, just leave a comment here! My little witch will pick up the names from my witch hat on Wednesday morning, good luck! Now off to Lady Coral's blog to see her super cool cranial creation and to join her giveaway!! Below you find the blog roll with all the sponsors participating this year (including yours truly). You can't believe the awesome prizes are being offering as giveaways! Everything created with love by talented artists. Be sure to visit each one!